Posted on November 21, 2017 at 12:31 pm. If you’ve ever suffered from a bad case of food poisoning, you know that it’s something you hope never to experience again. And when it comes to Thanksgiving and the traditional turkey feast, it pays to take a few precautions to avoid Bad Turkey! According to the CDC, FDA and the USDA, there are at least 12 precautions you should take to ensure that food poisoning or salmonella doesn’t show up as an uninvited guest at your Thanksgiving festivities. If your credit union has ever experienced a significant IT related systems failure, you also hope never to experience that sick feeling again. Interestingly, some of the steps necessary to prevent Bad Turkey are similar to the steps necessary to prevent Bad Recovery! Turkey: Thaw your turkey slowly in a refrigerator, don’t rush it by putting it out on the counter to thaw at room temperature. Disaster Recovery: Implementing a viable Disaster Recovery solution takes time, a thorough approach and regular testing. 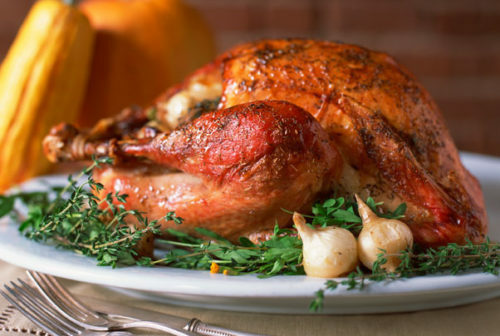 Turkey: Raw Poultry can contaminate anything it touches and extra precautions are warranted. Follow these simple rules…cook, clean, chill and separate. Disaster Recovery: Contamination in the backup and recovery process is a constant threat and the source of contamination is often what you least expect. Turkey: Properly stuffing a Turkey is more science than art. To reduce the risk of food poisoning, use the cook, clean, chill and separate rules. To stuff the turkey’s cavity, ensure that it is done just before the turkey goes in the oven. Monitor the internal temperature closely, ensuring that all stuffing reaches a safe internal temperature of at least 165 Degrees. Putting stuffing in a casserole dish and cooking separately from the turkey at a minimum of 165 Degrees is widely thought to be the safest way to prepare stuffing. Disaster Recovery: When it comes to recovering a failed server, the recovery results are only as good as the backup you are relying on to perform the recovery. Many people believe that backups function on a “set it and forget it” model. However, even the most scientifically advanced backups require proper monitoring and none are fool proof. Backups fail for numerous reasons and even those that show as complete may have skipped a critical file or component in the backup process. To ensure that recovery will complete successfully, monitor backups and systems to ensure that all backups run to completion, are health checked and have proper retention policies. Turkey: All poultry is inspected for “wholesomeness” and is required by the USDA or the governing State, but “grading” for quality is not mandatory, although many companies pay to have their poultry graded. Grade A is the highest quality and the only grade you are likely to see at the retail level. Grade A indicates that the poultry products are virtually free from defects such as bruises, discolorations, and feathers. Bone-in products will have no broken bones. For whole birds and parts with skin on, there will be no tears in the skin or exposed flesh that could dry out during cooking, and there will be a good covering of fat under the skin. Also, whole birds and parts will be fully fleshed and meaty. NO HORMONES have been approved for use in turkeys. Antibiotics may be given to prevent disease and increase feed efficiency. In approving drugs for use in livestock and poultry, the Food and Drug Administration (FDA) and Food Safety and Inspection Service (FSIS) work together. FDA sets legal limits for drug residues in meat and poultry. FSIS enforces the limits FDA sets for drug residues. Disaster Recovery: When you want the most reliable method of disaster recovery, it pays to use hardware and software components that are in the upper echelon of Gartner’s Magic Quadrant. However, enterprise level backup and recovery components often come with a substantial price tag. Choosing a Managed Service Provider (MSP) that utilizes components from Gartner’s Magic Quadrant to eliminate pricing barriers to top tier solutions by implementing a shared distribution model for their customers, is the easiest way to get state-of-the-art recovery assurance at a fraction of the cost of DIY solutions. Whether you’re looking to serve friends and family a delicious, wholesome and safe Thanksgiving bounty or you’re looking to ensure that your IT systems are easily recoverable, it pays to follow some basic rules, with a focus on proper preparation and safety. Happy Thanksgiving From Your Friends at Information Management Solutions!